Propeller-driven air cars and boats were popular in the 1950 and 1960s. They solved the problem of complicated and failure-prone transmissions and had no traction issues regardless of terrain. Recall the James Bond movies of the era that featured these vehicles regularly. As a teenager, I built an air boat out of a block of styrofoam and a Cox .048 Babe Bee engine. A rudder was controlled by my OS 3-channel RC system. It ran pretty well - nothing to get excited about but it was my first radio-controlled model of any sort. 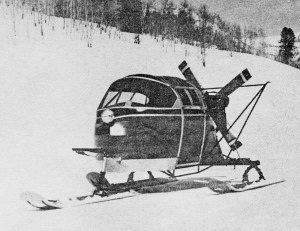 This Snowcar is a much more sophisticated type of vehicle and is actually modeled after a full-scale propeller-driven vehicle. If I ever have the luxury of retirement, it would make a nice little project for the snowy winters here in Erie, Pennsylvania. When winter sweeps down over the great National Parks of the West, Park Rangers maintain their lonely patrols and tours of inspection with the use of the CallAir Snowcar. Powered by Continental or Lycoming 90 to 135 h.p. engines, these rugged craft are able to penetrate sections that would be totally inaccessible by any other means of transportation. Seating two to four persons, the Snowcars manufactured by CallAir at Afton, Wyoming, are not only used by Rangers, but are rapidly becoming popular with ranchers, sportsmen, and those who want safe, fast, practical transportation in snow country. Building this authentic model of the CallAir Snowcar is not a difficult task. It is a challenge rewarded by the terrific performance the craft can whip up on a frozen lake or snow-packed field on the end of a U-Control line. For the R/C fan looking for something different, this is it. The large cabin can be adapted to any kind of equipment without any real consideration for weight. 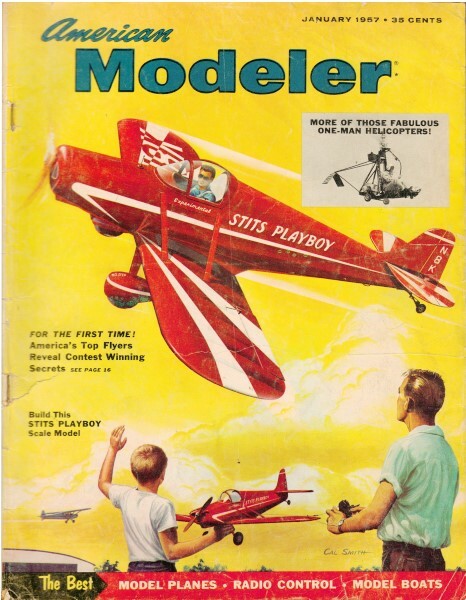 Essentially, the model is a fuselage built on a platform, a sheet of 3/16" balsa, 5" wide, 173/8" long. Using Ambroid cement throughout construction, the first step is to cement a block of 3/4" balsa, 5" x 4 1/4", to the nose of the platform. Follow the nose contours shown in the plan, using a coping saw and coarse sandpaper, bearing in mind the extension of this block beyond the actual nose to form the support for the steering mechanism later. Round off the edges of the rear of the platform with sandpaper. 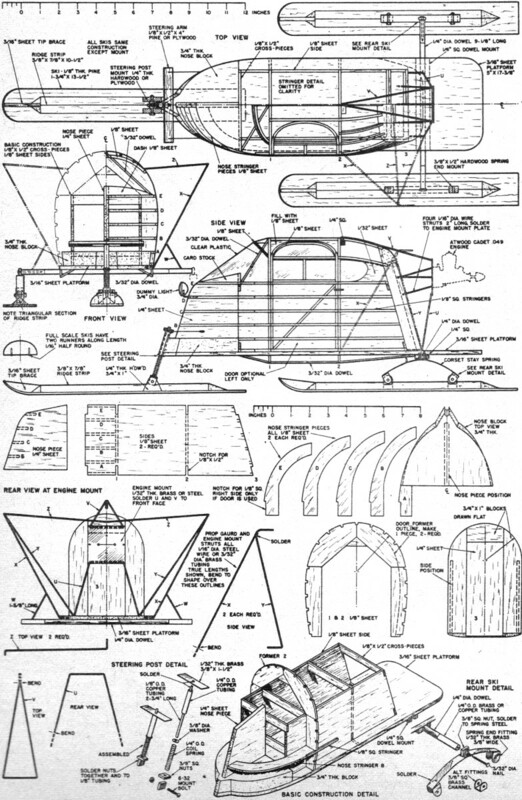 The body is built around a simple box structure erected on top of the 3/16" sheet platform. Cut two sides to outline shown from 1/8" sheet. Then cut eight pieces of 1/8" x 1/2" all to the same length, 3 3/4,". These serve as cross pieces to join the box sides. Erect box on platform or over plan. While box structure is drying cut out the 1/4" sheet nose piece, the nose stringer pieces and the formers 1 and 2. Join former top parts over plan before putting in place on model. If door on left side is to be used, do not cut notches for 1/8" sq. on nose stringer pieces on left side or in lower part of former 1. Cut out door frame pieces to same pattern of former 1 and 2. Now cement 1/4" sheet nose piece in place on top of 3/4" block nose. Cement side parts of formers 1 and 2 against box sides, then cement former tops in place. Now add nose stringer pieces B, C, D and E to nose area. Pin door frames in place against sides of formers preparatory to adding stringers. The rear of body is made up of 3/4" x 1" blocks cemented around a 1/4" sheet rectangle in center. This assembly can be made over plan, then removed, carved and sanded to shape, then cemented in place against rear of box structure at 3. Note that sides overlap box structure 1/8" each side to allow for stringers. Notch rounded top of rear block for the seven stringers above the window level. Now add 1/8" sq. stringers to body structure. If door is to be used for access to R/C equipment, cut away part of 1/8" sheet box side between former 1 and 2. Put a 1/8" x 1/4" brace diagonally across back of door structure for added strength. Make a curved top of door from 1/8" sheet bent to shape or carved from thicker material. Fill in corners next to curved door top with 1/8" sheet. Rear window is outlined with piece of 1/32" sheet. 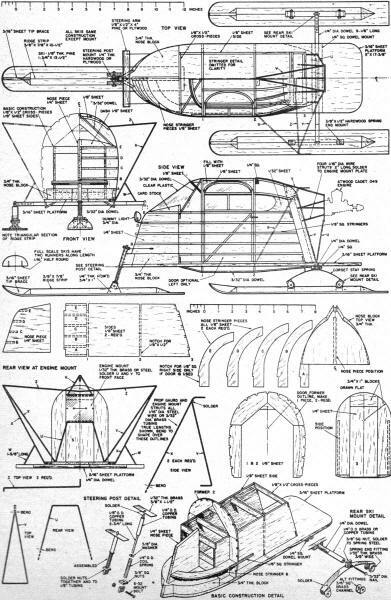 Windshield is braced with curved piece and scrap at top. Dummy tube braces are 3/32" dowel or aluminum tubing. Cut 1/8" sheet piece to curve of dash or instrument panel and cement to top of front cross piece. Deck over area from top of dash forward to top of nose stringers E with card stock or heavy paper. Door structure can be cut loose from body and trimmed to open and close freely. Stiff paper and fabric can be used for hinges. Cement strip of 1/16" sheet under roof section to hold top of door flush with roof surface. Complete body structure by adding dummy tubing braces to bottom of platform. These can be 3/32" dia. dowel, aluminum or brass tubing. Window areas on the model can be paneled with 1/32" sheet balsa as a support for the plastic window covering if desired. A small scrap of 1/4" sq. is cemented to the top of former 2 to be used later to anchor top engine mount struts. The three skis are made of 1/8" soft pine, 1 3/4," wide, 13 1/2" long. Soak tips in hot water for thirty minutes. Bend tips to shape over round object, clamp until dry. Cement a triangular shaped strip of 3/8" balsa to the ski top, 10 1/2" long, 7/8" wide. Slot front end of block to fit a curved piece of 3/16" sheet balsa. This provides additional strength to the ski tip. Additional construction instructions appear on the full size plans.